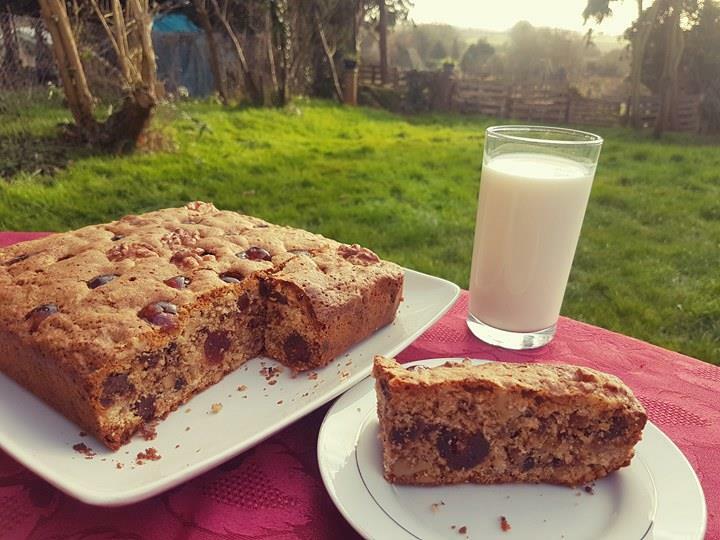 I enjoyed a slice of my Bishop’s cake with a glass of milk, how will you enjoy yours? Today is a special day, and I’ve made a special cake to celebrate. 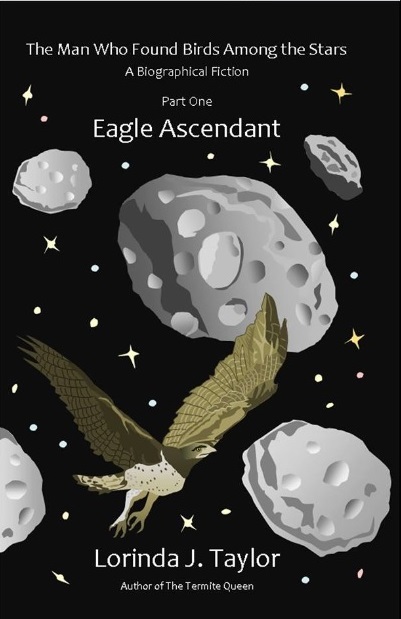 It’s the launch day of a new book by my author friend, Lorinda J Taylor – The Man Who Found Birds Among the Stars, Part One: Eagle Ascendant: A Biographical Fiction. There’s a launch event on Facebook today (8am-4pm Mountain Standard Time, 11am to 6pm Eastern Time zone, 3pm to 11pm UK time), so do join in the fun there later to read excerpts, play some caption games, and win free books! To celebrate this launch, I’ve made one of Lorinda’s favourite cakes; Bishop’s cake, using the recipe that Lorinda used to use herself. I have to say, this is definitely now one of my favourite cakes too, it’s crammed full of yummy stuff. I’ll come to the recipe in a minute, but first let’s take a little look at the book. Robbin Haysus Nikalishin was born on 31 October of the year 2729 and ultimately became the first starship Captain to make contact with extraterrestrials. This fictionalized biography, composed 50 years after Nikalishin’s death, recounts the first 31 years of the life of a man who is hailed as one of Earth’s greatest heroes. During this portion of his life he enjoyed many triumphs, joys, and loves, but he was not immune to failure and tragedy. In 2761 a major space disaster completely changes the course of his life. Whether it will be for better or worse is left for the reader to decide. All heroes are human beings and all human beings are flawed, and the man the Earth came to know as “Capt. Robbie” was a very human man. How sweet is that? He was thrilled to bits, he’s never had a book dedicated to him before. Anyway, now for the recipe. Line a pan with wax/baking paper. Lorinda recommends a loaf pan, but I used a square pan instead (for a boring reason that I won’t explain). The square pan I have is larger than a standard loaf pan, so the cake isn’t as deep as it would be in a loaf pan, which you can probably tell from my picture at the top. Your choice! Beat the eggs, sugar, and melted butter well together. Sift the flour, baking powder and salt over it and mix well in. Spoon the batter into the prepared pan, decorate with walnut halves and cherries. Bake until firm. Lorinda said 1½ hours, which it probably is in a loaf pan, but in my larger square pan, it only took just over an hour as it’s shallower, so do check it after an hour. Remove from pan, peel paper off, and leave to cool completely on a rack. This cake really is soooooo good, I definitely recommend trying it. Remember to join us later at Lorinda’s Facebook launch event! Wow! Thank you, Vanessa! I always did the Bishop’s Cake in a loaf pan and put rows of cherries and walnuts halves down the top for decoration. But the deliciousness is the same! And thanks to Neil for being such a supportive fan – or maybe a fanatic supporter! The event is about to get underway, so I’ll see you there! Bring the cake, because we need FOOD! And I hope all your friends will stop by – it’s public on FaceBook, so you don’t need a personal invitation. The reason I didn’t use a loaf pan is because I couldn’t find mine! Well I was able to find a silicone one I have, but I didn’t want to use that because I wasn’t sure it would hold shape properly during cooking, I wanted proper metal! I did decorate this one with walnut halves and cherries on the top but you can’t tell that well from the picture I posted here. I will definitely be making this cake again, thanks for sharing the recipe! Oh, I just remembered – I used to line the loaf pan with greased wax paper. Then you can lift it out and peel off the paper, because the cake is really solid. It’s so cool that your husband earned a dedication, and the cake sounds yummy. It really is! Even though I enjoy making pretty light cakes with frosting and so on, I actually prefer to eat a more hearty rustic cake like this. I don’t eat cake but admit I can smell it from here. It’s so attractive too. Hello Tess! Lovely new avatar/profile pic you have there. I’m not a big cake eater but I can’t stop eating this one!